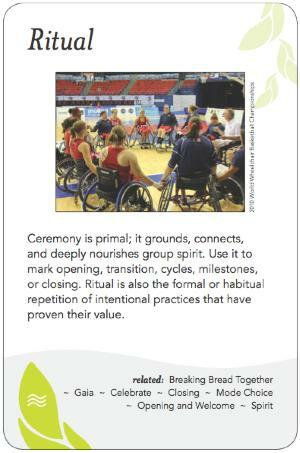 Ceremony is primal; it grounds, connects, and deeply nourishes group spirit. Use it to mark opening, transition, cycles, milestones, or closing. Ritual is also the formal or habitual repetition of intentional practices that have proven their value. There are two main usages of the term Ritual in this context. One is the repetition of activity that typically becomes unconscious after a sufficient number of times; that is, a habit such as always setting up the chairs for the meeting in a circle. The second usage is a special time set aside with explicit intention where the group engages with modes beyond the rational in pursuit of a desired result. These uses have in common the demarcation of time and/or space in the invocation of the activity. Rituals are often used at Openings, Closings, to shift from one modality to another, or to deepen or bring in a different energy. When a newcomer (or outside consultant) joins with an existing group, the culture will include tacit rituals as well as more formal rituals that the newcomer needs to learn in order to mesh well. Examples of tacit rituals include turning off cellphones when the session starts, dressing in a particular style of clothing, or going out to the pub together after the meeting. Even a tacit ritual may have significant symbolic meaning. For example, setting up chairs in a circle implies that all participants are equal and that anyone may speak, as contrasted with rows facing a podium. Having some things that are consistently done the same way saves time and energy of having to figure it out from scratch each time, and builds a shared sense of group culture and identity. More explicit rituals often include an altar, which may carry items with meanings and connotations for the participants. Ritual is a way of honouring that we are much more than our minds: our spirits, hearts, and bodies are all brought into it. People may speak, dance, sing, have silent times together, or more. Groups vary widely in their use of non-rational modes. For example, some religious groups such as the Salvation Army or Quakers might pray together before making a decision, while most secular groups would be acutely uncomfortable at such a suggestion. Meanwhile an activist group might start with a round of personal check-ins on how people's lives are going aside from any business at hand before starting the meeting, which wouldn't fit at all in many businesses. Rituals can become impediments to creativity, to change agility, to welcoming newcomers and new rituals; they can fuel resistance to change. Fellowship for Intentional Community used to have a ritual at its semi-annual board meetings of choosing two tarot cards at the beginning of the meeting. One would be turned over and shared immediately, while the other was kept face down until the end of the meeting and then shared. This was done to help invite non-rational insight into the deliberations. A cohousing community in Canada wanting to clear energy and make progress on a long-time stuck issue did an "expressive mandala" ritual at a special meeting. First people briefly called out names of emotions they associated with the issue: anger, fear, anxiety, despair, and so on. Each feeling was written large on a piece of paper and laid out on the floor in the midst of the circle. Then for the bulk of the ritual, people took turns standing at the papers that matched the feeling they wanted to express in that moment, and speaking out their feelings with full energy and intensity. Afterward there was a real shift in the community on the issue. "We need ritual because it is an expression of the fact that we recognize the difficulty of creating a different and special kind of community. A community that doesn't have a ritual cannot exist.... What we need is to be able to come together with a constantly increasing mindset of wanting to do the right thing, even though we know very well that we don't know how nor where to start. This seemingly frightening position is amusing to the spirit that watches over you. ...Invocation is a call placed by a person to a spirit. To invoke the spirit is to call on the invisible. The language of invocation must not be confused with order and command. It must be closer to a plea, a humble request. This is because ritual is a spirit-based activity performed by humans. For anything to happen, the ritual must be dominated by humility." "Do you know why you go to the bathroom? Do you know why you urinate?" "Of course I know. I can't help it." "Well then, you know why we do ritual."